A still frame from DJ Sadhu’s video claiming the solar system moves through the galaxy along a vortex. This claim is—to be charitable—incorrect. Image credit: DJ Sadhu, from the video. I’ve been getting lots of tweets and email from folks linking to a slick-looking video, a computer animation showing the motion of the planets around the Sun as the Sun orbits around the Milky Way Galaxy. It’s a very pretty video with compelling music and well-done graphics. However, there’s a problem with it: It’s wrong. And not just superficially; it’s deeply wrong, based on a very wrong premise. While there are some useful visualizations in it, I caution people to take it with a galaxy-sized grain of salt. Why? The basis of the claim is that the planets aren’t orbiting the Sun heliocentrically, but are instead a vortex going around the galaxy. Normally I wouldn’t bother debunking stuff like this; wacky claims are made all the time and usually disappear on their own. But in this case I’m getting a lot of people telling me about it, so clearly it’s popular—probably because it seems superficially right, and it has very nice graphics. I’m also seeing it spread around by people who do understand science, but missed the parts of it that are way off. With stuff like this, it always pays to dig a little deeper. So let’s break out the shovels. The maker of the video, DJ Sadhu, is clearly talented at computer graphics. But his science…well. Right off the bat, I could see where this video was headed. He says straight-out that the heliocentric model of the solar system is wrong. It’s Sadhu’s claim, though, that’s grossly wrong, on par with saying gravity doesn’t exist. Heliocentrism is the idea that the Sun is the center of the solar system, and the planets orbit around it (there are also important details, like the planets orbit on ellipses, and these orbits are tilted with respect to one another). It replaced the older geocentric model, where the Earth was the center of the solar system. Geocentrism as a physical model leads to a hugely complex and overwrought system that has to make all kinds of weird assumptions to work (look up epicycles if you have some Tylenol handy). Heliocentrism makes a lot more physical sense and works far better. I’ll note both models have their uses. If you want to know where to look in the sky for a particular planet, you use geocentric coordinates. We live on the Earth, which seems like it’s not moving while the sky wheels around overhead, so that makes sense. But if you want to send a space probe to that planet, you’d better use the heliocentric system. Your math will be a lot easier, because both that planet and the Earth are moving. Sadhu is claiming that heliocentrism is wrong, and that the motion of the planets around the Sun actually makes a vortex. What he actually means is a helix, not a vortex. They’re different in more than just name; they’re actually very different physical motions with different properties—you can get helical motion without the particles in it interacting, like in the solar system, but in a vortex the particles interact through drag and friction. But let’s not argue over semantics. Look at the video again: Sadhu shows the Sun leading the planets, ahead of them as it goes around the galaxy (he makes this even more obvious in a second video; see below). This is not just misleading, it’s completely wrong. 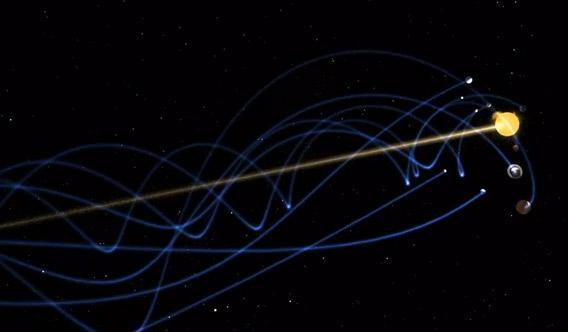 Sometimes the planets really are ahead of the Sun as we orbit in the Milky Way, and sometimes trail behind it (depending on where they are in their orbit around the Sun). This is plainly true to anyone who actually observes the planets in the sky; they can commonly be seen in the part of the sky ahead of the Earth and Sun in the direction of our orbit around the Milky Way galaxy. Again, I’m not arguing some small detail here. The idea that the planets trail behind the Sun as it moves through the galaxy is fundamental to what Sadhu is saying about the helix—as I’ll explain below (in the section “Where Do All These Ideas Come From?”). But first, there’s a bit more to see. To be fair, he does now call the motion of the planets helical. But he still depicts them as trailing behind the Sun, which is wrong. Note also at the beginning of the video he specifically compares heliocentric and his interpretation of helical motion, reinforcing the incorrect “leading Sun” idea. Look carefully at his animation of heliocentric motion. He shows the direction of the Sun’s motion around the galaxy as the same as the plane of the planets’ orbits. But this is not the case. The solar system’s plane is tipped with respect to the galaxy by about a 60° angle, like the way a car’s windshield makes an angle with respect to the car’s forward motion. This is actually critical: In the helical model, he shows the planets as orbiting around the Sun perpendicular to the motion of the Sun around the galaxy; “face-on”, if you like. This is wrong. 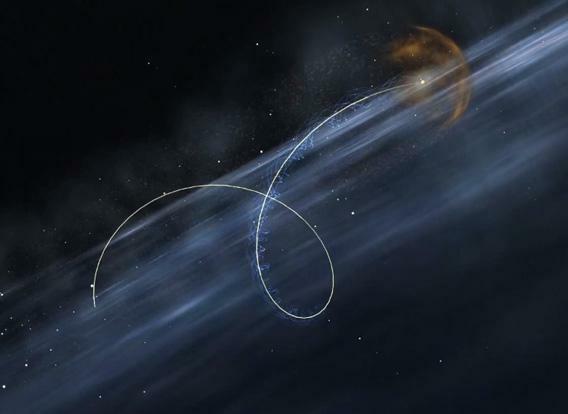 Because the orbits of the planets are tipped by 60°, not 90°, they can sometimes be ahead and sometimes behind the Sun. That right there, and all by itself, shows this helical depiction is incorrect. In the real model, heliocentrism, you do get that sort of ahead-and-behind motion, exactly as we observe in the real sky. But there’s more. He shows the Sun moving around the Milky Way, bobbing up and down and spiraling along. Like the first video, some of this is right, but mostly it’s way off. Our galaxy is a flat disk about 100,000 light years across, with a central bulge of stars. The disk has billions of stars in it, and their combined gravity is what keeps the Sun orbiting the galactic center, just like the Sun’s gravity keeps the planets orbiting it. 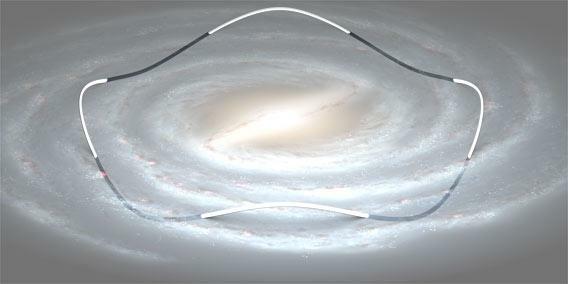 A far more correct (though exaggerrated vertically for clarity) depiction of the Sun’s motion around the Milky Way galaxy has it bobbing up and down every 64 million years due to the gravity of the galactic disk. The length on one orbit of the Sun around the Milky Way isn’t about 240 million years. As it orbits the galaxy, the Sun does in fact bob up and down, more-or-less as shown (though only about four times per orbit around the galactic center; Sadhu has it bobbing dozens of times per orbit in the video). That’s because of the way the gravity in the disk works. This is actually pretty cool: If you are slightly above the disk you feel an overall pull down, toward the disk. Imagine the disk is just a huge slab of matter, and the Sun is above it. The gravity of the disk would make the Sun plunge down into it. Since stars are so far apart, the Sun would go right through the disk and out the bottom. But then the disk would be pulling it up, once again toward the disk. The Sun would slow, stop, and reverse course, plummeting into the disk once again. It gets about 200 or so light years from the midplane of the galactic disk every time its bobs; the disk is 1000 light years thick, though, so we always stay well inside it. But these oscillations would go on forever, the Sun moving up and down like a cork in the ocean. If a force acts on a top, the axis wobbles, called precession. Since the Sun is also orbiting the galaxy, the combined motion makes that lovely waving pattern, up-and-down as it goes around, like a horse on a carousel. So Sadhu has that part (more or less) right. Mostly. But he then adds a third component, a twisting spiral around the Sun’s path he attributes to precession. That part is wrong, very wrong. Precession is what makes a top wobble as it spins, and happens when you have an off-center force on the top. Poke a spinning top and it wobbles, precesses. The Earth itself precesses, its axis making one complete wobble every 26,000 years or so, because it’s tugged by the gravity of the Sun and Moon. That is apparently what Sadhu is representing in his video. But that wobble does not affect the Sun at all. It’s just something the Earth does. But Sadhu adds that to the Sun’s motion around the Milky Way, which makes no sense. His video shows the Sun corkscrewing around the galaxy, sometimes closer to the galactic center and sometimes farther away over and over again. To go back to the carousel analogy, its like the horse is circling the center, moving up and down, and also left-to right. But that’s not what the Sun really does. There is no left to right motion (toward and away from the galactic center multiple times per orbit). That corkscrew pattern Sadhu shows is wrong. In that video and its notes Sadhu confuses coordinate systems, forces, and motions pretty often. So why does he depict all these motions so incorrectly? To figure that out, I had to go to his source. In his videos and on his page, Sadhu says that he learned all this from a man named Pallathadka Keshava Bhat. I found a text written by Bhat called “Helical Helix: Solar System a Dynamic Process” ([sic]; also that’s a PDF and slow to load) describing all these ideas, and not to put too fine a point on it, it’s gibberish. Seriously, none of it makes any sense. Bhat claims heliocentrism is wrong, but then uses one fallacious idea after another to back this up. I could write pages debunking his claims, but I’ll try to keep this short. I read Bhat’s explanations several times, trying to be as charitable as possible. From what I can gather, what he’s saying is that due to the Sun’s motion, the planets make those corkscrew helical motions through the galaxy, with the Sun and the tip, and the planets trailing behind, and therefore heliocentrism is wrong. Note that Sadhu’s video depicts them this way as well. But that’s utterly wrong. If this were true we’d never see the superior planets (the ones farther from the Sun than us: Mars, Jupiter, and so on) going on the far side of the Sun. Yet we do, all the time. A still frame from DJ Sadhu’s second video, incorrectly depicting the Sun’s motion through the galaxy; it does not make a winding corkscrew pattern as depicted. Image credit: DJ Sadhu, from the second video. Also, we have multiple space probes that have visited other planets, many of them still in orbit. If heliocentrism were wrong in the way Bhat describes, then those probes never would have made it to those planets. The calculations used to send them there would’ve been wrong. We don’t have to account for the Sun’s motion around the galaxy at all when calculating these spacecraft paths, so Bhat cannot be correct. The claim that the Sun is at the tip of the solar system with the planets trailing behind is also demonstrably wrong. The Sun does not really lead the solar system through the galaxy like the tip of a bullet as Bhat apparently claims (and as Sadhu’s videos show). The planets go around the Sun, and the whole shebang moves around the galaxy as a unit, tipped by that 60° angle. That means sometimes the planets are ahead of the Sun, and sometimes behind it along that galactic orbit. It’s a bit like walking down a path while spinning around your head a string with a ball attached at the end (and the circle it makes tipped by 60°). Sometimes the ball is ahead of you and sometimes behind you. It always moves with you down the path no matter how fast you go, and relative to you is always moving at the same speed. If you trace your own motion you make a line, and the ball makes a tilted helix. This is what Bhat and Sadhu are trying to describe, but get wrong. There are many more errors and logical missteps Bhat makes in his text. For example, given Sadhu’s misapplication of the Earth’s precession, I tried to read what Bhat had to say about it. But it’s so garbled (and plain wrong; he claims the precession cycle is 225,000 years long, when it’s actually 26,000 years) it’s like trying to untie the Gordian knot. And there’s much more. He thinks that there should be solar eclipses every month if heliocentrism is right (pp. 46 and 134; in reality that’s due to the Moon’s orbital tilt). He also seems to have a fundamental misunderstanding about the Earth spinning as it orbits the Sun (see page 30 of his text) which he concludes must mean heliocentric orbits are impossible. Essentially every page I read has basic, fundamental errors on it. And that’s what Sadhu was basing his (lovely, if incorrect) videos on, mind you. I’ll note that if you poke around Sadhu’s site, you’ll find links to all sorts of, um, odd conspiracy theories, from 9/11 Truthers to chemtrails to the ravings of David Icke (who claims—seriously— that reptilian aliens live under Denver airport and control the world), just to name a few. To me, that puts his other ideas into perspective. DJ Sadhu’s videos are very pretty, and do have some basis of truth in them. But in my opinion that kernel is lost due to the way he based this on Bhat’s distorted view of the Universe. It seems right, or looks cool, or appeals to some sense of how things should be. But how things should be and how they are don’t always overlap. The Universe is a pretty cool place, and works using a fairly well-regulated set of rules. We call those rules physics, they’re written in the language of math, and trying to understand all that is science. Not everything that’s cool is science, but everything in science is cool. That may not be one of those universal rules, but from everything I’ve seen, it’s true nonetheless.